Rudy Saul Gomez, who prefers to be called Saul, might seem like an average student in Hollywood High, but if you get to know him he is anything but that. Gomez is currently in the twelfth grade with a G.P.A. of a 3.96, placing him as number 13 out of the 25 top seniors of the class of 2013. Gomez also has very interesting hobby which is paying the guitar. Although he has other hobbies, Gomez is usually recognized for his grades and his guitar playing. Gomez plays the guitar religiously. He plays and practices around 10 hours every week. Gomez’s hobby has led him to participate in a band, named Scarred Condition, which started with four other people, three of which have stayed since the creation of Scarred Condition. Scarred Condition has been together since 2009 when Gomez and his band mates were playing randomly. They just initially started playing as a hobby, but once they started writing original songs, they started taking things more seriously. Gomez is the guitarist and, as of June of last year, the vocalist. Gomez’s inspiration to play the guitar and join a band came from Stevie Ray Vaughn and Chuck Schuldiner, both of them are guitarists and vocalists and are revered as legends. “The compositional mastery of Chucks and Stevie no doubt shaped my music but their personalities stuck in me. Stevie never let his ego get the best of him, and was a nonchalant individual. Chuck went against all the metal stereotypes and proved himself a life and animal loving gentleman,” he said. 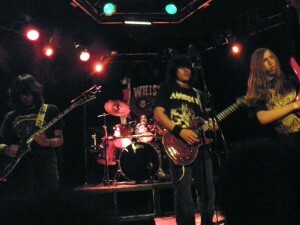 Gomez’s debut performance was in Hollywood High’s Battle of the Bands. “I was dead nervous since we’d never played live. 30 seconds into our first song I drop the guitar pick and have to play without it,” commented Saul Gomez. “I saw Rudy (Saul Gomez) performing in the Battle of the Bands, and it was pretty hard to believe a guy that amazing at playing the guitar went to our school,” said SAS junior Adan Tlaseca, who had known him since the performance. “Usually when I hear Saul, I think about how smart he is. Also how he tries to help you out when you don’t understand something,” said Eraldo Cristiano. Saul is quite an intellectual individual currently taking 2 AP classes, calculus and chemistry, and is acing both. All the while self-studying for AP psychology and AP computers. Another hobby Gomez enjoys is playing video games. He, at one point in his life, had owned every Nintendo console ever released. He even owns Nintendo emulators.